The first post in this series discussed general ways to pray for kids with special needs. 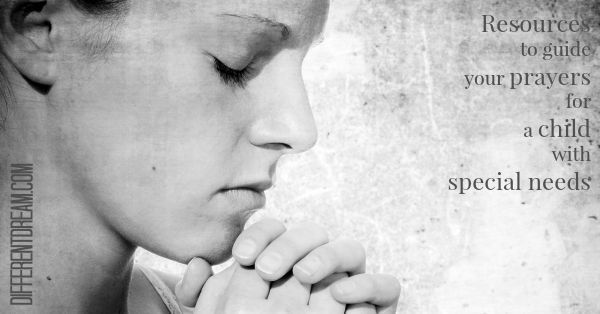 As promised the second post provides specific ideas of how and what to pray. Pray daily. If you can set aside even a few minutes to sit down and pray, great. But if your child’s care doesn’t allow for that, be creative. Maybe you can pray while doing a mindless, daily task like making the bed or washing dishes. One mom interviewed in A Different Dream for My Child got a large print Bible so she could read and pray while pounding her daughter’s back, which was part of the little girl’s respiratory therapy regime. Start small. If you haven’t prayed on a daily basis for your child before now, set a small, achievable goal. Commit to praying five minutes a day for your child. Once you’re comfortable with that, increase the amount of time. In addition to praying for your child’s health, pray for caregivers and teachers, too. Start slow. Research shows it takes six weeks to form a new habit. So don’t add anything to your first small, daily goal until the six weeks are up. Each day of the week or month, ask God to develop a different character trait or fruit of the Spirit within your child. Ones that apply to children, no matter their ability level include love, joy, peace, gentleness, faithfulness, self-control and kindness. Pray scripture for your child each day. When my son, Allen, was at the height of his struggle with post-traumatic stress disorder caused by early medical trauma, I realized II Timothy 2: 21-22 spoke directly to his situation. So I began praying it for him every day. When God began fulfilling those scripture promises, I added II Timothy 3:14 – 15. 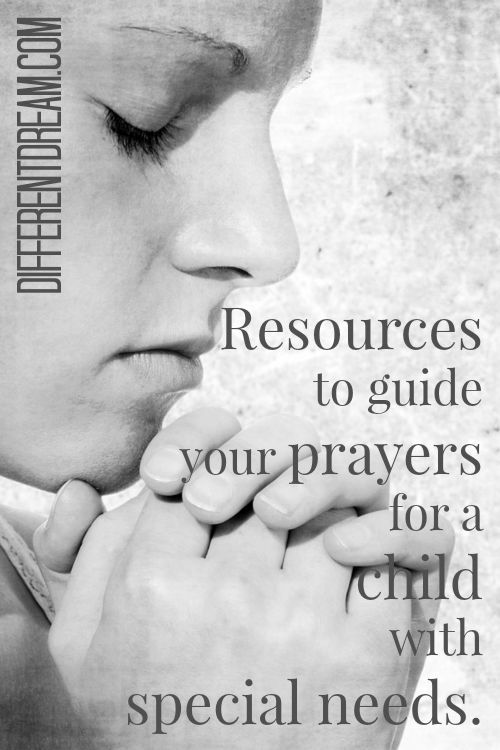 As you find scriptures that speak to your child’s situation, begin praying them back to God. *The prayer guide is now available at Different Dream’s Free Stuff page. Yes, I did. Thanks for asking. One of them can be downloaded for free from DifferentDream.com at this link: http://f06.70c.myftpupload.com/free-stuff/thirty-ways-to-pray-for-your-family/. That guide and five more are part of my book, Different Dream Parenting, which can be purchased here: http://www.amazon.com/gp/product/1572934670/ref=as_li_ss_tl?ie=UTF8&tag=diffedream-20&linkCode=as2&camp=1789&creative=390957&creativeASIN=1572934670. And a third version for people caring for loved ones of all ages is coming out in the Caregiver’s Notebook which comes out November 1, 2014. It can be pre-ordered here: http://www.amazon.com/Caregivers-Notebook-Organizational-Support-Others/dp/1627070540/ref=sr_1_1?s=books&ie=UTF8&qid=1407180896&sr=1-1&keywords=The+Caregiver%27s+Notebook+Philo. I hope they are a help to you! Did you ever create that prayer guide you mentioned? I love your name! Isn’t it surprising how we sometimes miss the obvious? That’s why my book “Different Dream Parenting” contains a prayer guide for each section of the book. To help parents discover the obvious their care giving duties don’t leave time to find for themselves.